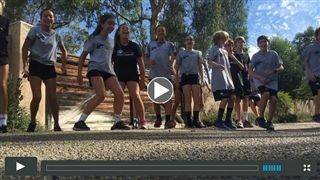 With no cross country meets on the schedule last week, Coach VanderHorst and her middle school athletes had extra time during practice for a fun and creative video project. Students were filmed completing drills, doing cheers, and, of course, running. The brief, documentary-style videos give a glimpse into the boundless energy, humor, and spirit of the close-knit squads. Click here and here to get a glimpse of life as a Firebird distance runner.